Evaluation of and procedure for setting thread ring gages to master setting plugs. 1. Thoroughly clean, inspect for nicks or damage and calibrate the truncated master thread setting plug gage. The truncated master thread setting plug gauge should be straight or have back taper, no front taper, and be in tolerance. Lubricate the truncated master thread setting plug gage with a thin film of light oil. 2. Thoroughly clean the thread ring gauge and inspect for nicks. Remove the sealing wax with a small pointed knife. Turn the locking screw counter clockwise until it is loose. Turn the adjusting screw clockwise, opening the thread ring gage until the master thread setting plug gauge freely enters. In some cases a small screwdriver should be levered into the locking slot area to facilitate opening the thread ring gage as you turn the adjusting screw. 3. Turn the thread ring gauge onto the truncated master thread setting plug full form section with no more than one thread of the thread ring gauge beyond the last thread of the truncated master thread setting plug gage. 4. Turning the adjusting screw counter clockwise and rotating the thread ring gauge on truncated master thread setting plug gage until there is a slight drag between them. 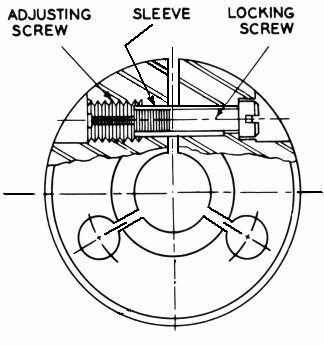 Tighten the locking screw. The thread ring gauge should exhibit a larger degree of drag or snug fit to the truncated master thread setting plug gage. This operation may have to be repeated to obtain the proper degree of drag. The degree of drag is somewhat subjective, particularly with regards to the size and pitch of the thread ring gauge and where the truncated master thread setting plug gage is found to be in its tolerance range. Generally smaller thread ring gauges and those set to truncated master thread setting plug gages which are near the low tolerance limit would require less drag than larger thread ring gauges or thread ring gages set to truncated master thread setting plug gauges which are on the high limit (**See note below). 5. After adjusting the thread ring gage and with truncated master thread setting plug gauge still inserted, the thread ring gage should be tapped with a brass or plastic hammer to fully seat the thread ring gauge to the truncated master thread setting plug gage. The drag after doing this should feel the same as before. If not, the thread ring gauge was not properly seated. Repeat Step 4. 6. Next step is to turn the thread ring gage to the truncated portion at the front half of the truncated master thread setting plug gauge. (Figure 1) The drag should be essentially the same. There should be no shake or play. If there is, the thread ring gage has lost its root relief or its flank angles are worn out of tolerance and the thread ring gauge should be reworked or replaced (*See note below). Remove the thread ring gage from the truncated master thread setting plug gauge. 7. To test the thread ring gage for taper or bell mouth, turn the thread ring gauge onto the truncated portion of the truncated master thread setting plug gage 1-1/2 to 2 turns. You should detect some drag. Continue turning the thread ring gauge onto the truncated master thread setting plug gage noting any definite difference in the degree of drag. If the drag increases, this indicates an unacceptable bell mouth or taper condition. Remove the truncated master thread setting plug gauge and follow the above procedure for the other side of the thread ring gage. The fit should be about the same on both sides. If the thread ring gauge is bell mouthed or tapered, it should be reworked or replaced (*See note below). 8. The minor diameter of the thread ring gage can be measured with an internal measuring machine or Go and NOGO X tolerance plain plug gauges. The minor diameter of the thread ring gage is in tolerance if the Go X tolerance plain plug gauge enters and the NOGO X tolerance plain plug gage does not. 9. It is strongly recommended that once the thread ring gauge has passed all the above, the locking screw and adjustment screw holes be filled with sealing wax to prevent any tampering. 10. You are now ready to place the ring gage into service. * NOTE: To have your gages calibrated, repaired or replaced, click on the Calibration Request for Quote Form (Recommended Browser: Internet Explorer) or contact us here. ** NOTE: A thread ring gage's setting is unique to the particular truncated master thread setting plug gauge the thread ring gage it is set to and cannot be expected to be duplicated on any other truncated master thread setting plug gauge without readjustment. This is because of differences in allowable gage maker tolerance on lead, angles and pitch diameter for the truncated master thread setting plug gauge.